White Phosphorus produced dense clouds of phosphorus pentoxide which was noted to be first used in an artillery barrage for this purpose at The Battle of Loos. The First World War use of the chemical with its trench warfare gave this company a foothold in the human suffering that was to come. Unfortunately animals used in experiments for man’s war mongering were not so fortunate. 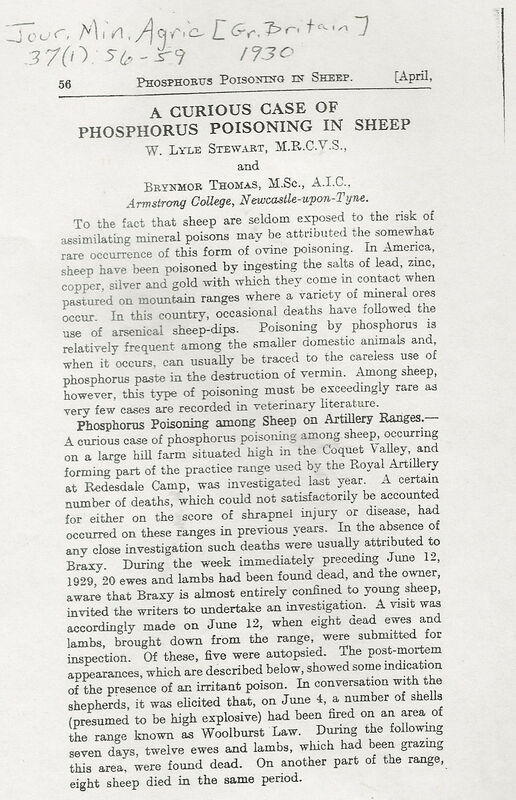 An early study dated 1/5/30 entitled “Report on toxic effects of white phosphorus, titanium tetrachloride and chlorosulphonic acid smoke” used a number of animal experiments to test which of the three chemicals produced the most toxic effects. Guinea pigs and rabbits were basically placed in a gas chamber measuring one cubic metre for periods of thirty minutes on successive days upto a total of seven. 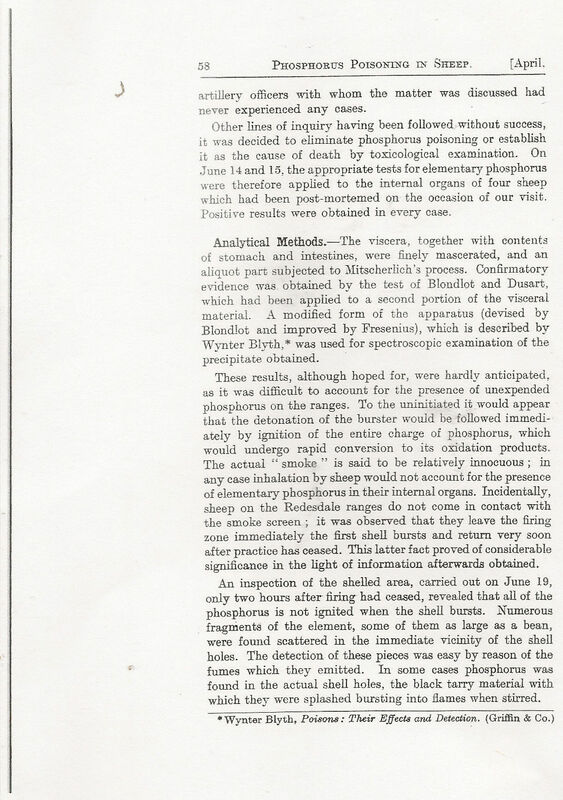 The white phosphorus smoke was produced by exposing 0.5 grams in a porcelain dish in the chamber with the animals. Titanium tetrachloride and chlorosulphonic acid being liquids, 0.75cc and 1.00cc were used respectively. The smoke produced in each chemical chamber was circulated with an electric fan. 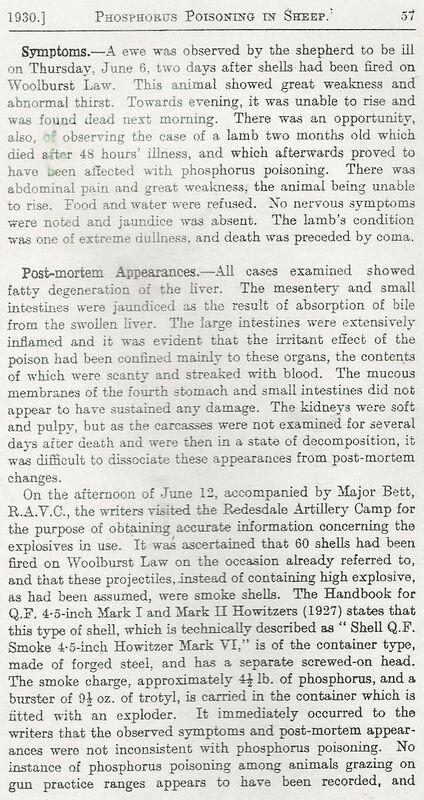 Very little other than “nasal irritation” was noted in the rabbits, which when also killed showed very little post mortem effects of what was a very limited post mortem- no examination of the liver or fatty organs. The experimentor, Surgeon Commander E.C Holtom, R.N at Porton’s physiological department concluded that “white phosphorus smoke is the least damaging of the three” chemicals used based on the observed effects of the animals. Further chemical tests are alluded to in the paper concerning a range of experiments using many of the smoke screening chemicals that Threfall mentions had been experimented with at Oldbury. SO WITH THIS LEGITIMACY AS “THE LEAST” DAMAGING, THE HIGHLY TOXIC WHITE PHOSPHORUS BECAME THE FRIEND OF MILITARY STRATEGISTS, AND THE COWARDS THAT MADE IT IN THE WEST MIDLANDS. 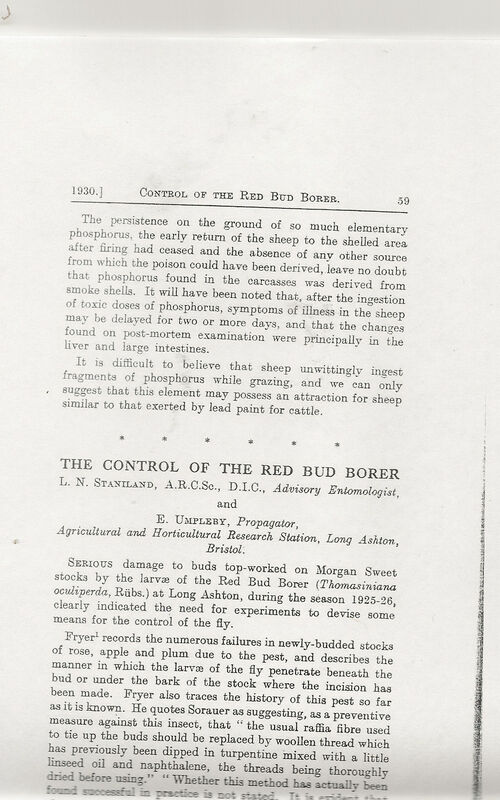 The following case from the same year comes from The Journal of the Ministry of Agriculture. It confirms the link between military white phosphorus use and animal poisoning. It also concludes that the use of smoke shells does not expend all the p4 fired, but scatters the particulate matter as a poison for grazing animals. THEY HAVE WE BELIEVE, TOTALLY FAILED IN THIS REGARD. Even after World War Two, exercises on land grazed by livestock continued to raise issue, as this parliamentary question concerning a military camp at Llanegryn, Merioneth, Wales revealed in 1946, ironically involving a former RAF squadron leader turned MP. The reply is far from convincing. asked the First Lord of the Admiralty whether he is aware that poisonous bombs or shells are being used in military exercises by troops from the military camp at Llanegryn, Merioneth; that these missiles contaminate pastures and caused the death of a large number of sheep, dogs and a bullock; that this is contrary to an undertaking given by the military authorities; and what action he is taking in the matter. Smoke bombs containing phosphorus have been used in this area during the training of Royal Marine Commandos, but not for the past four months. I am advised that the number of animals who have died from poisoning has not been more than two, for which compensation has been paid. Although no undertaking has been given that bombs of this type would not be used, instructions have been issued that their use is to be kept down to the minimum essential for training purposes, that the bombs shall not be used at all on good pasture land, and that farmers shall be given due warning when exercises involving their use begin and end. I am having further consideration given to the question as to whether it is essential to use this type of bomb in peacetime training.